- Remove unwanted pets from your account. - Transfer pets to another account. - Trade pets with another user. You can read more about these different uses in the sections below. The pound was released on the 30th of June In 2000. First the pound was ran by a scary character named Ms. Worley. Later on Dr. Death took over the pound. He's the Techo in the picture below. He started to run the pound with the help of a Pink Uni. Then on April 26th 2007 when the Neopets layout was revamped, the pound was closed so that tnt could re-design the pound to work with the new customisation clothing. It was relaunched a year later on April 30th 2008. The new pound came equipped with a new transfer feature that everyone was happy to see. Finally on the 2nd of October the pound received a feature to trade neopets due to the fact that many people were being scammed out of their neopets during the two part trading process. The pound does have a few rules and conditions to it. The rules are shown below. If you click on the [NT] link you will get a confirmation of this rule from the Neopian Times Editorial. There are 3 pets who are affected by the pound. One is the Lutari species of pet who will simply disappear when you try to pound or transfer them. Second is, whenever an ice coloured Bori is pounded it will transform into a blue Bori. This is due to the fact that Ice Boris were given out as a limited time offer for downloading the neopets toolbar a long time ago and TNT wanted to keep them as unique prizes. They can however, be transferred. Third is, whenever a magma coloured pet is placed in the pound it will transform into a red pet. If your pet has a no-trade petpet attached, for example the cardboard petpets from a newbiepack, you cannot pound or transfer the pet. You have to remove the petpet first. There are three types of clothing: Regular Clothing, which is bought with neopoints. Deluxe Clothing which is clothing that came from a paint brush, and NC Mall clothing which was bought with neocash. When a pet is placed in the pound all of its clothing is removed no matter what type it is, these will be placed in your inventory. When a pet is transfered normal clothing items will be sent to the new owner of the pet. This means that NC Mall Clothing and non-tradable clothing (such as the Burger King Canada Backgrounds) will not transfer. For Deluxe Clothing items, there are special circumstances in which the clothing will or will not tranfer. When a pet painted with a colour that comes with deluxe clothing is transfered, any deluxe clothing from that colour is transfered is received by the new owner. Regardless of whether the pet is currently wearing it or not. If you transfer a Zombie Buzz all zombie clothes will go along with the transfer. The only way to keep them is to pound the buzz. However only deluxe clothing from the current color of the pet is transferred. For example, You could adopt a Desert Zafara with its desert clothing. But its impossible to adopt a Rainbow Zafara with desert clothing. For a list of what each pet looks like without its deluxe clothing you can refer to Sunnyneo's Rainbow pool page. The main page of the pound contains three doors. 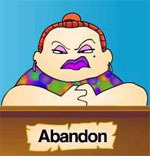 The first door leads to the Adoption page, where you can adopt other neopets for a fee. 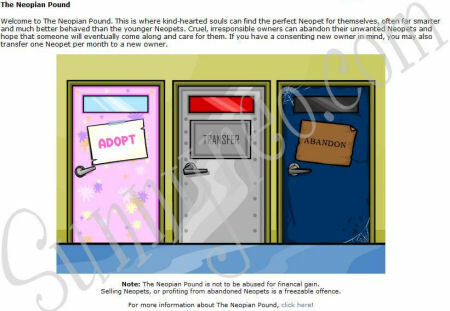 The second door leads to the transfer page, where you can Transfer or trade pets with other people and the third door leads to the Abandon page, where you can abandon your neopets in the pound. The adopt feature allows you to adopt already existing pets that were pounded (note that you may own up to 4 pets, not more). The adopt feature was one of the first two original features of the pound. 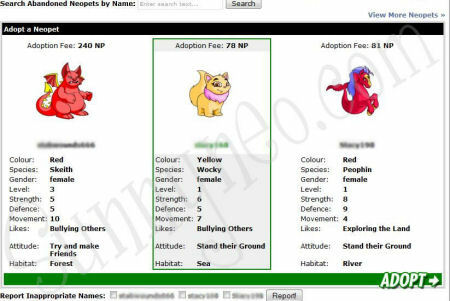 To adopt a pet you must click on the one you want, then click on the adopt button on the bottom right side of the adopt page.If you want to see a different set of pets simply click the View More Neopets link, or hit the refresh button on your browser or the F5 key on your keyboard and three new random pets will be brought up. If you know the name of the pet you want you can search for it in the search bar at the top of the page, you however can only search for names and not things such as colour or species. You must also pay a fee determined by the pets level and other stats. You can visit Sunnyneo's adoption cost calculator to find out how much the fee is for each pet. The other original function of the pound is the pound function. This function allows you to remove pets from your account and place them in the pound for others to adopt. To pound pets there is a fee of 250 neopoints. You can only pound one pet per day and only after the pet has reached the age of a week. Remember any pet placed in the pound is fair game for anyone else, no matter whether you were trying to transfer it through the pound instead of the user to user transfer. Any person who adopts your pet is not obligated to return it. The User to User transfer is a new function introduced in 2008, which allows you to safely transfer pets from one account to another account safely. This function has a fee of 1,000 neopoints paid by the sender, plus the receiver paying the regular adoption fee (see Sunnyneo's adoption cost calculator). Each account a certain amount of pet transfers available each month. How many you get depends on your account age. It can be up to 7 transfers. Look on our Account Age Information guide to see how many transfers your account has. If someone offers a transfer and it is rejected it counts as the transfer of that month for the person who offered, however nothing is held against the person who rejected the transfer. If someone offers a transfer to someone who already accepted a pet for that month the simply receive a message saying that person cannot accept a transfer for that month and have their transfer for that month returned to them. You can check if you have transfered out a pet for the current month here. A pet can only be transfered once per day and can only be transfered if the pet is over a week old. When someone has offered a pet for you to adopt you will receive a notice at the top of the page, much like a neomail. The notice icon looks like a Robot Hissi. User to User trading was introduced at the end of September in 2008 due to the fact that people were scamming others by saying they would trade pets with them, then having the user send the pet to them first while they disappeared. The fee of the transfer is the same for both: 1,000 neopoints plus the adoption costs. If you want, you can even block User-to-User Transfers at your Site Preferences. This function uses both your send transfer and your acceptance transfer for that month, due to the fact that you send and receive a pet at the same time. For this function you do not need to have a empty spot in your account since you trade one pet for another at the same time. When trading or transfering the description and petpages of the pet being transfered are cleared. This way of transferrring is NOT recommended! If you decide to do a pound transfer and lose your pet, that's your loss. While we don't encourage pound transfers due to the risk of losing your pet, it is possible to transfer pets to other accounts using the regular pound and nothing more than speed at clicking the adopt button. A pound transfer works as follows. 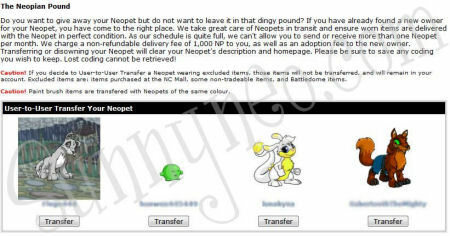 Two people agree upon an exact time that the pet will be pounded, the person who is adopting the pet should ensure that they have enough neopoints on hand for the adoption costs. Then the adopter goes to the adoption page and searches for the pet's name using the search bar. This can be done about a minute or two before it is actually pounded to be sure they're there at the right time. On the search results page they will receive the message that the pet they are searching for is not in the pound. The adopter should then continually refresh on that page while the current owner places the pet in the pound at the agreed time. Once the pet shows up in the search, the adopter simply clicks on the pet then the adopt button. When pound transferring a pet it is best to discuss the time and pet's name through neomail only, due to the fact that if it is done in public other people could find out the time and name of the pet being transferred and adopt it themselves. Speed is key in using this method of pounding, due to the fact that every second the pet is in the pound is a chance for someone else to see and adopt it. On the Pound Chat thread on the Neoboards there are many abbreviations and other terms used, this guide will explain the most commonly used ones. OTB: Offer to beat, a way of saying what the best offer you've received for a pet so far is. RN: Real Name, a pet with a name that is also a human name, for instance Sarah or Katie. RW: Real Word, a pet with a name that is a real word instead of a made-up name. A word that can be found in the dictionary. 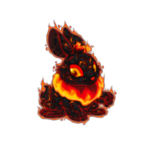 UC: Unconverted pet: A pet with the old artwork from before Neopets re-did pets to allow them to wear clothes. UFA: Up For Adoption, used when someone is giving away one of their pets and is looking to give it to someone. UFT: Up For Trade, used when someone is looking to trade their pet for a pet of another person. VWN Very well named pet, A pet that does not have random letters, numbers or underscores in its name. Often the first letter of the name is capitalised. WN: Well named pet, usually a name that does not have any random letters or numbers. Chain lending usually occurs with avatar pets. During chain lends, the original owner of the pet lends the pet to one person who then lends it to another person designated by the lender, who then in turn lends it to another person. Chain lends usually take course over a few days since a pet can only be transfered once per day. As of December 2008, clothes transferring has been made impossible. The deluxe clothes will always go with a pet when using tranfer, even if the pet is not wearing the clothes. This would mean a pet would have to be pounded not to take the clothing with it. The only way to still do a clothes transfer is if a person has a clothed pet from the lab ray, but doesn't want to keep the clothes and wants to give away the pet. They can then transfer it to a new owner, and they would remove then pound the pet after receiving it. The original owner can then decide to re-adopt trough the pound, or let someone else adopt it. A term that is used quite often on the pound chat board is "Custom pet". Custom pets are pets who someone created specially for you in exchange for a pet of yours. They will usually offer to create a pet of a colour you choose with the name you choose and in exchange you trade them a pet of yours. Other times someone might offer a custom where they choose colour and you simply choose the name and species (for instance, you're allowed to choose any custom Baby pet. Or a person might give you a exact price of the custom, for example on the chat board you might see someone offer you a 4 million neopoints custom in exchange for a pet of yours, this means you can choose any species and colour as long as it doesn't cost more than 4 million neopoints to make. 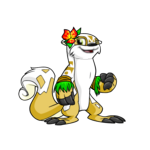 Many times people with Fountain Faerie Quests will offer to use their FFQ to create you a custom pet in exchange for a pet of yours. If you're offered a custom FFQ, note that you are not able to receive a Royal, Msp, Sponge, Robot, Ice, Usuki or Quiguki pet. This is question 5663, archived from Editorial Issue 369. Let's make this clear. Trading Neopets is not a spiffy way to buy trained Neopets, or to basically purchase what you might consider a Neopet "upgrade." Trading Neopets is literally for trading Neopets. One for one. There should be no Neopoints, paint brushes, special training, or anything else involved in these trades. This is question 5694, archived from Editorial Issue 371. This is okay, as long as there aren’t any "tips," Neopoints, or items traded alongside this. This is question 5707, archived from Editorial Issue 372. The most common scam found in relation to the pound is the trade and run scam. Here both people agree to trade pets but the scammer demands you to send your pet to them first. After receiving the pet the scammer simply disappears, many times self freezing so that all the evidence on the chat board is destroyed then un-freezing at a later date. It is easy to avoid being victimised of this scam. Simply propose a User-to-User trade, this way the other person and you are trading at the same time. If they claim they have no transfers left, just do the trade next month, don't be impatient. Another form of scammers are people who watch the pound for nicely painted pets, then grab the pet when they see it. If they miss one, they neomail the new owner with usually a sob story that it was their pet and how they lost it, and they try to get the new owner to give them the pet. It is not against any rule to watch the pound for nicely painted pets, it is against the rules however to neomail someone pretending that a pet belonged to you. You have no obligation to return a pet you found in the pound, if someone starts to harass you they can be blocked and reported. Even if a person shows *proof* they really owned the pet, the screenshots can be faked, and the *friends* neomailing you can be the same person on a side account. SunnyNeo's advise, if you got a nice pet from the pound, keep it. The other person shouldn't have pounded it if they didn't want to risk losing it. You can receive a avatar from the pound.